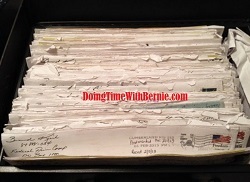 DoingTimeWithBernie.com: Does Rep Peter King's close relationship with convicted felon Bernard Kerik jeopardize USA Homeland Security? 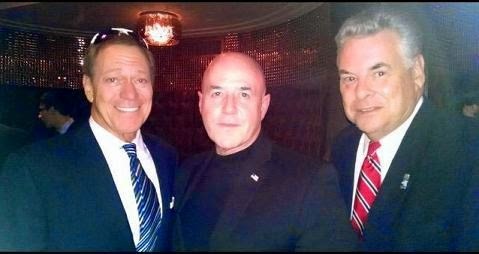 Does Rep Peter King's close relationship with convicted felon Bernard Kerik jeopardize USA Homeland Security? Does Rep Peter King's close relationship with convicted felon on probation Bernard Kerik jeopardize USA Homeland Security? Has anyone seen a sitting U.S. Congressman cuddle up to an eight-time convicted felon ON PROBATION like U.S. House Representative Peter T. King (R) and Bernard Kerik? Being close personal friends is one thing. We all need support now and then on a PERSONAL BASIS. However, professional mingling of a sitting congressman serving on the Homeland Security Committee fraternizing and allegedly sharing confidential secrets to an eight-time convicted felon currently on supervised release convicted of crimes involving trust and truth does shout appearance of impropriety to me! How many other convicted felons on probation do you see doing that? The saddest part is that Rep King has Bernie Kerik shadowing him Washington almost every other week with full access to the building and no one seems to notice or care? We pretend to be shocked when "whistle blowers" and/or "criminals" in plain sight as alleged traitor, Edward Snowden, who also have an "ax to grind" or "vendetta" with our US government violate our public's trust and security! Wasn't it just last July 23, 2014 we saw this felon on probation, Bernard Kerik, caught randomly and freely roaming the basement of the congress without any identification badge on TMZ ? Who gave that privilege and why? On several occasions, I have seen on both social and news media, in the public domain, Bernard Kerik, who appears on Newsmax TV quite regularly, speak on a topic of National security only to have US Rep Pete King follow him with the same talking point. Risky? I think so. They also appear together in public domain with Rep King acting in his role as a public servant on the radio. Bernard Kerik, in his new book, is a first class thumb-sucker who is not shy about proclaiming he is a "target" of the government despite pleading guilty to crimes of corruption, false documents, lying and more. Bernard Kerik is a felon desperately in need of money due to criminal restitution of over $187,000 to the US government plus heavy liens on his mans in Franklin Lakes NJ for unpaid defense lawyer fees. Bernard Kerik recently has been denied early release from his supervised probation due to expire October, 2016. At least one judge knows Bernard Kerik very well to not risk his release. In recent court filings, Bernard Kerik has requested foreign travel to the Middle East to find "full time work". The Middle East is a great place to do business but also a great place to act revenge on your country or escape criminal and financial commitments to the USA. It seems this country is playing fast and loose with our Homeland Security. That includes constituents of US Rep Peter T. King and the entire country. If the US government thinks it's NOT ok for Bernie Kerik to be released from "Supervision", be around guns or travel abroad, why are we trusting him to keep our Homeland security secrets and security? Why take that chance? By the way, who is "supervising" felon on probation, Berard B. Kerik? See something. Say something. Stranger things have happened. Never Forget.